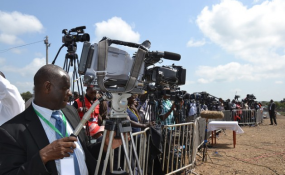 Local and foreign journalists cover a church function at Dedan Kimathi University (file photo). Nairobi — In what some may view as a case of 'do as I say, not as I do', US Secretary of State Rex Tillerson on Friday made it abundantly clear the superpower fully expects a respect for the democratic ideals of a free press and independent judiciary - a change of guard at the White House notwithstanding. Once the customary ego stroking was dispensed with at a joint press briefing given by Tillerson and his Kenyan counterpart Monica Juma on Friday, the former called out President Uhuru Kenyatta's administration for its January 30 switching off of Citizen TV, KTN News and NTV. He also advised that Kenya's Executive Arm of Government, correct its course where the Judiciary is concerned by respecting its independence. "We believe that there are actions that need to be taken in Kenya and that they need to correct certain actions like shutting down TV stations and threatening the independence of the courts. A free and independent media is essential to safeguarding democracy and giving all Kenyans confidence in their government," he said. A displeased Juma defended the shutdown as motivated by security concerns and describing it as "one-off." "The definition of democracy goes way beyond the media. But also the provision of free press in this country is secured within our constitution. And the incident that is being referenced here is a one-off incident. It is a matter that involved investigation of the police. "So the notion that there is a restriction of the media in Kenya is actually not backed by fact and reality." The Executive has been hard-pressed to defend its actions against the press and its week-long defiance of a court order that they be switched back on. Their contempt for that particular court order was compounded by their failure to abide by a court order for the release of the illegally detained self-styled General of the National Resistance Movement, Miguna Miguna. When he appeared before the Senate Committee on ICT on March 6, Cabinet Secretary Joe Mucheru failed to explain the reasons for the shutdown, describing it as a "national security issue," as Interior Cabinet Secretary Fred Matiangi claimed, at the onset. The three stations were taken off-air after President Uhuru Kenyatta summoned media owners to State House and warned them that they risked being taken off-air were they to give live coverage to the swearing-in of Opposition leader Raila Odinga as what turned out to be "the People's President." The Executive's problem with the Judiciary, preceded these events and took a turn for the worse when the Supreme Court nullified President Kenyatta's August 8, 2017 election and he uttered the now infamous words, "we shall revisit." It is not the first time the US has called out President Kenyatta for stifling the democratic space, with Tillerson's predecessor John Kerry and even US President Barack Obama, espousing the importance free and vibrant civil society on visits to Kenya. On coming into office, President Kenyatta's administration accused the West of sponsoring an overthrow through their development agencies. It then went on to clampdown on critical rights groups through the Fazul Mahamed run NGO Coordination Board; a man who remains in office until the end of April despite the courts and ombudsman having found him unsuitable to hold the public office as far back as 2016.